Leave one glazed section open to have some one lighting it or just repairing it. 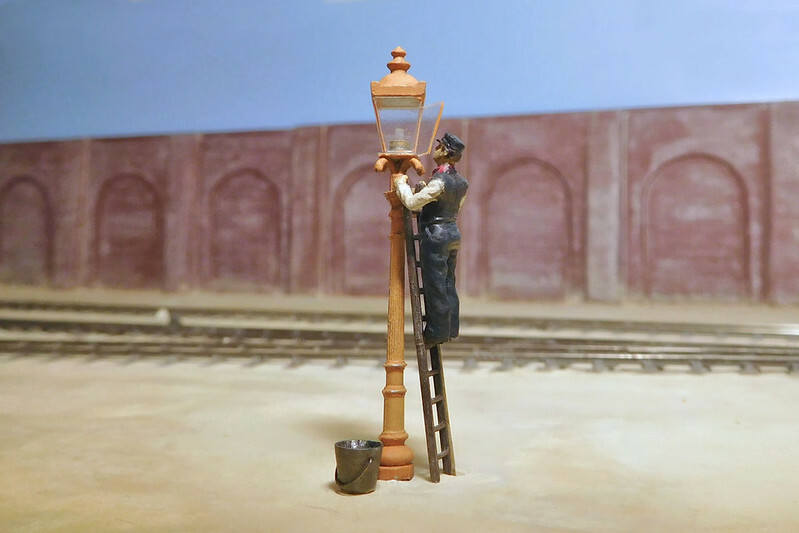 I think the lamp needs a bit of weathering, and our man Herbert Pocket could do with some water and a cloth in that bucket! That looks great, so natural. All pregrouping will want one. It will become as common as a funeral at a church and a cricket match on the corner field. Many might imitate, few will better. Females. Need to change your lighter's gender? Thanks Chris - although it was Richard's idea to have someone working on the lamp. Yes good idea about the H0 sets, may be some potential there. 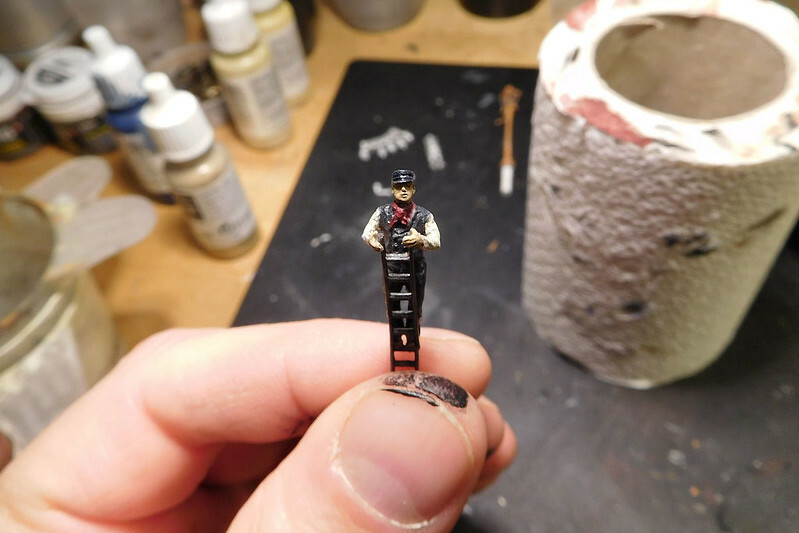 In any case I think I'll have to get some more of Andrew's loco crews, the ability to position arms and heads is a real bonus. 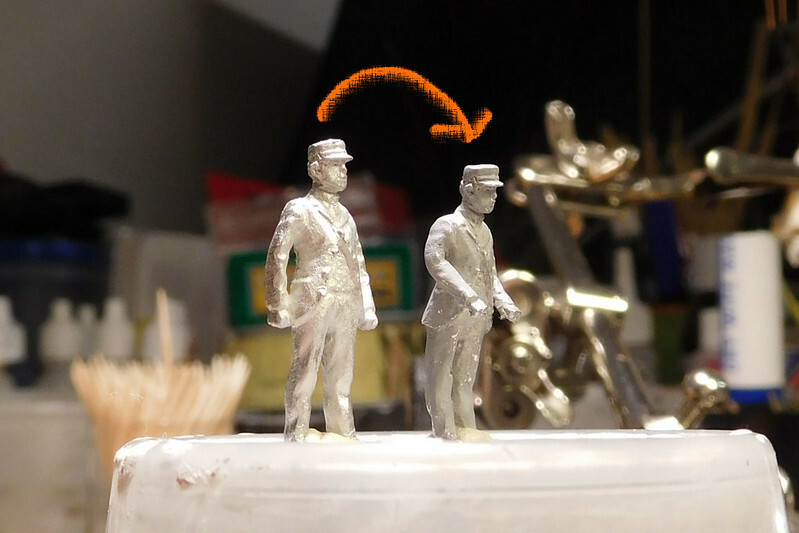 Of course you can do that with ordinary figures too by cutting them off or tweaking them, but it sometimes looks odd. Thanks Richard, it would certainly be easy enough for Andrew Stadden or Alan from Modelu to do a ready-made one. 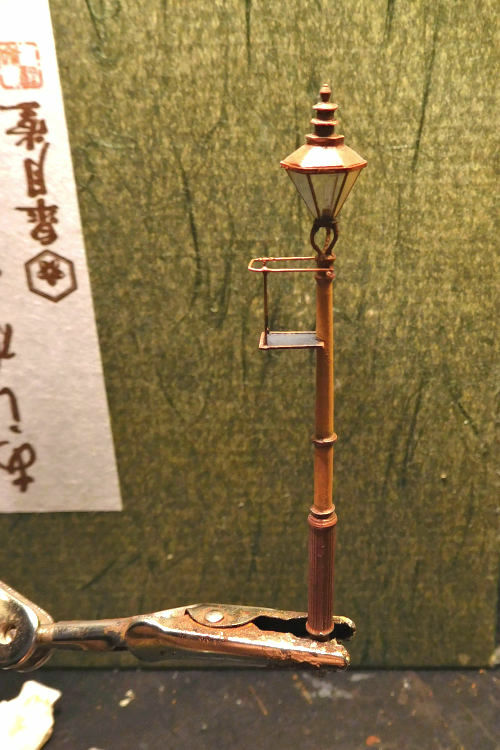 It would also be nice to see a range of scale lamps. 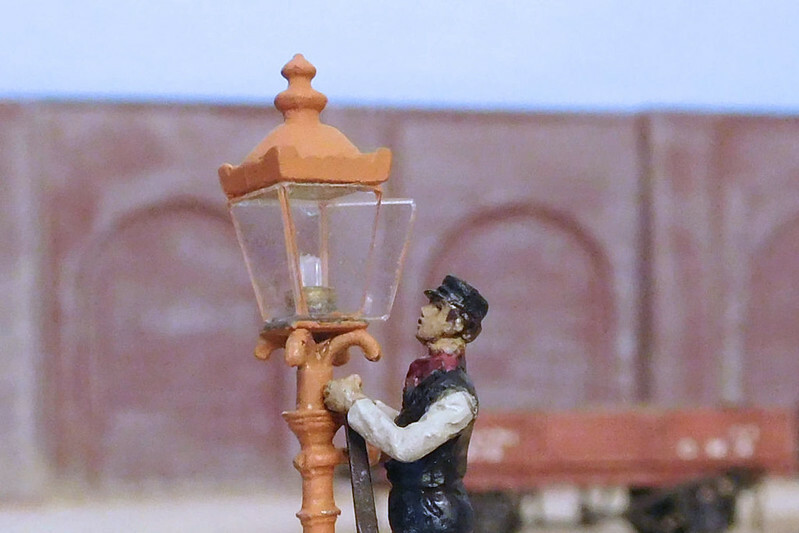 If you can make buffer stops for each company, then why not lamps? That's a great photo. There's something Monthy Python about it! 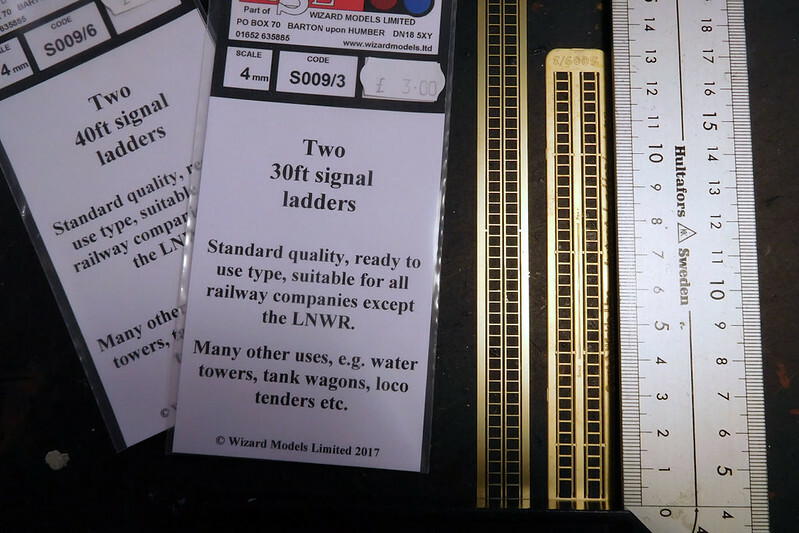 I'm working on a GWR yard lamp with a platform, like this. So far two failed attempts and much swearing! Was that during the wars I wonder? 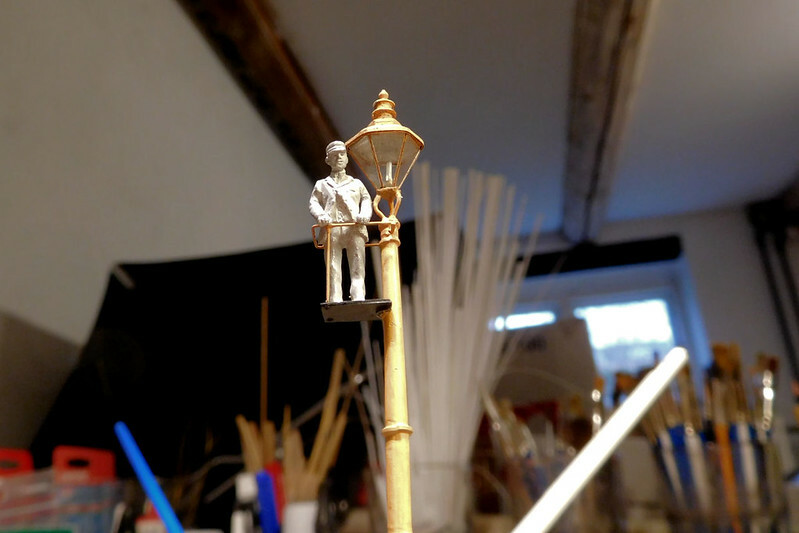 I did actually wonder who tended the lamps - I reckoned it would have been a job for the younger staff, so chose a youngish figure. But maybe I should have gone for someone even younger, if it was lad porters? As usual I go in awe of your craftsmanship. 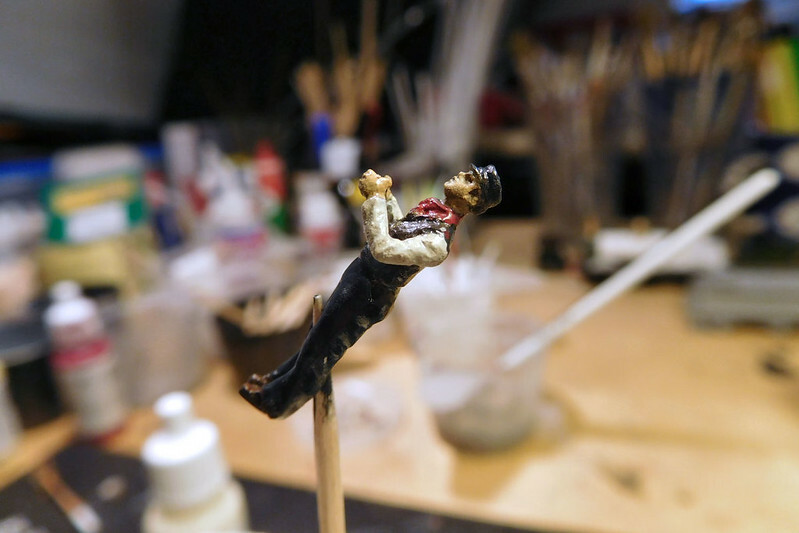 I would be pleased with the excellent close up pictures - never mind making the models. Water in his bucket - most definitely a gas light and no electricity. Was that during the wars I wonder? I tried and failed many years ago Mikkel ! Yes, almost certainly WW1. The cleaners' costume matches that worn by female carriage cleaners of the SECR in that war. Doubtless women did the same job in WW2, but the dress-with-trousers-for-modesty thing is an earlier custom than that. They'd have worn trousered overalls with no skirt in WW2. I'm pretty certain the women would have been laid off in favour of men in peacetime. Thanks Ray, yes gas or oil. I was aiming for oil when I fashioned the interior (not the standard GWR oil lamp I hasten to add), but the result may look more like a gas lamp! Anyway I was thinking he might simply be cleaning the glass. How I wish there were more photos of mundane scenes! Although I find that some of the GWRJ articles, and books by the likes of Kevin Robertson, can provide nice details, via the excellent interviews with railwaymen about their everyday tasks. Another good reason why we need more WW1 layouts! Many thanks John. I'm trying to keep the current layout open and spacious, but with little scenes like this to break up the view. Got some horsedrawn wagons to add too. That's very nice though, it deserves being brought to light (ha!). Oh. I know that picture so well and was hoping to create that very scene in the future so thanks for showing me a good way to make the lamp when I get that far, if you get to build what is in the picture I will certainly be copying your ideas. Thanks Mikkel, your a star. 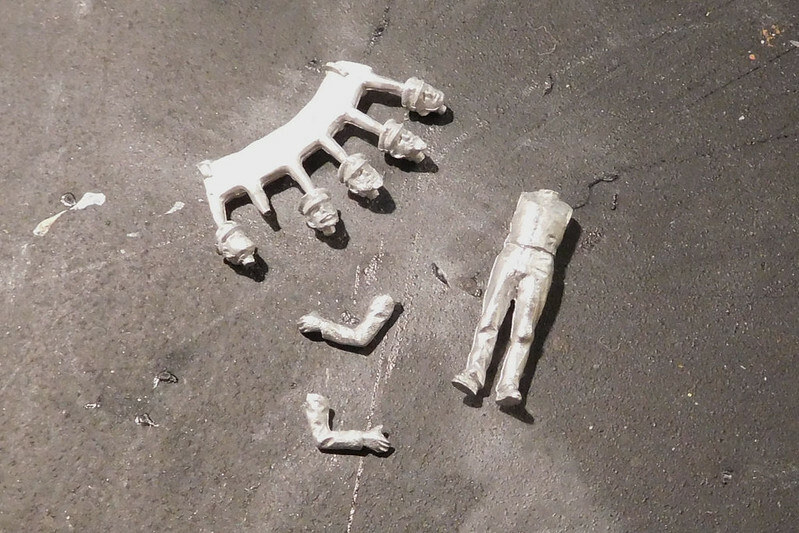 Hi Jim, yet it's a great scene - I look forward to seeing you model that, it will be quite something! 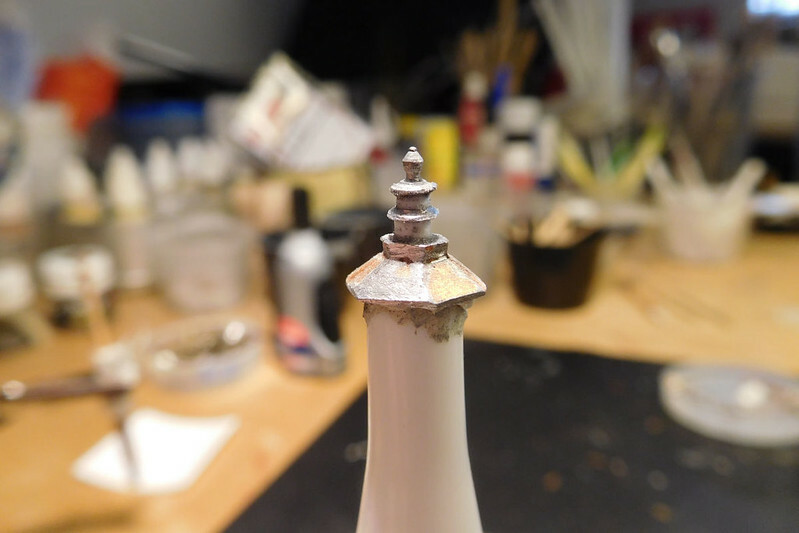 Am working on the lamp, I'll post some photos when there's a bit more progress. 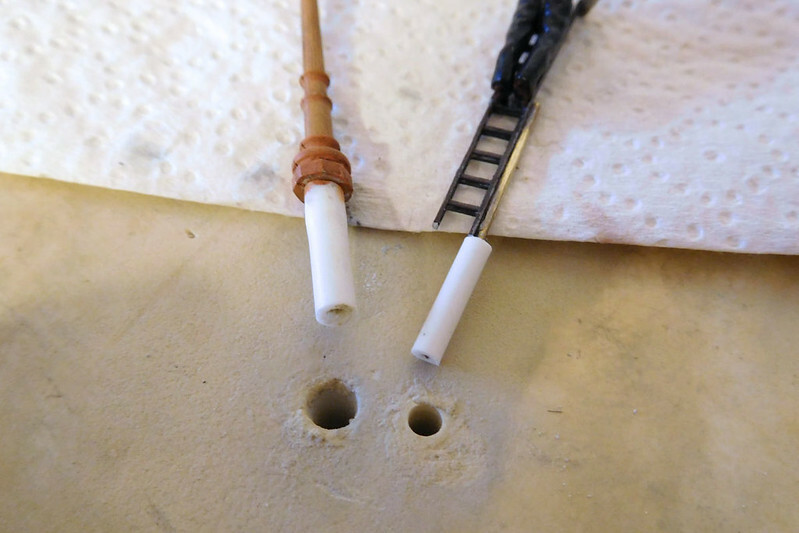 .................................the result may look more like a gas lamp! Anyway I was thinking he might simply be cleaning the glass. 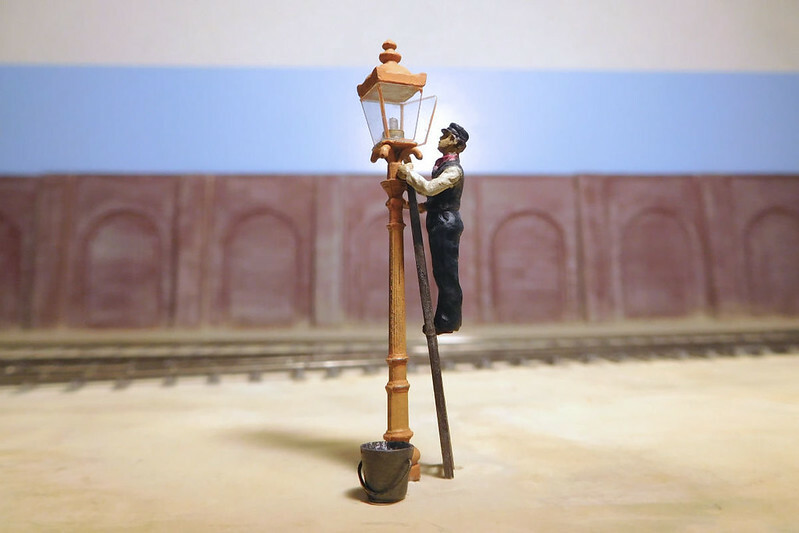 There were other tasks that needed a ladder on gas lamps. One was re-setting the clockwork time-clocks, which needed to be done fairly regularly, to follow the seasonal variations in day length. 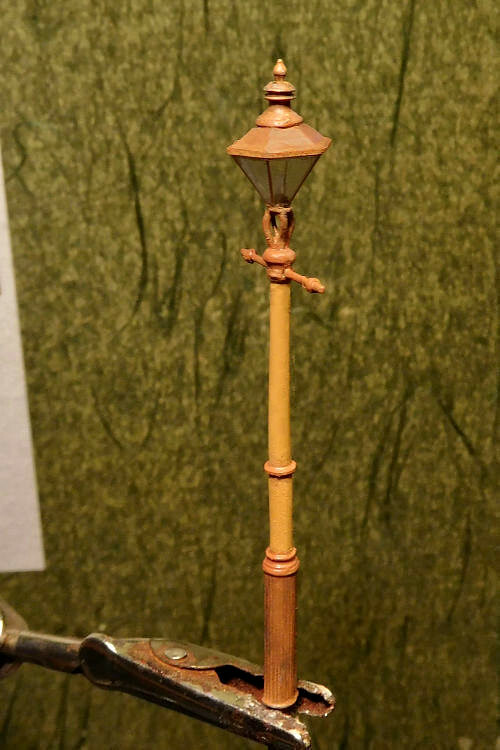 We had gas lamps in the street, when I was a small boy, and one game was to wait until close to 'lighting up time' and then kick the lamp-post. If one was lucky, it was enough to jog the mechanism and open the gas valve, so turning on the light. Then there's that old expression "running like a lamplighter" - last heard in use by Henry Blofeld on Test Match Special, to describe a batsman taking a quick single, or possibly unwisely dashing back for two. Timers for gas lamps, that sounds very futuristic to me Am I all wrong in aiming for oil lamps in a yard around 1900? We used to kick at the lamps too (electric ones), and if we were lucky they would go out! Might just be Blofeld original. 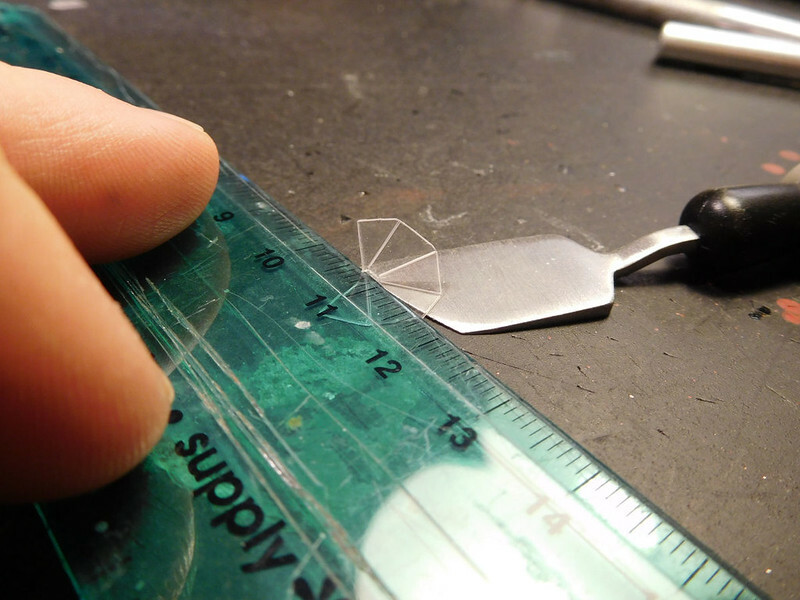 The glazing was cut and folded as previously described. 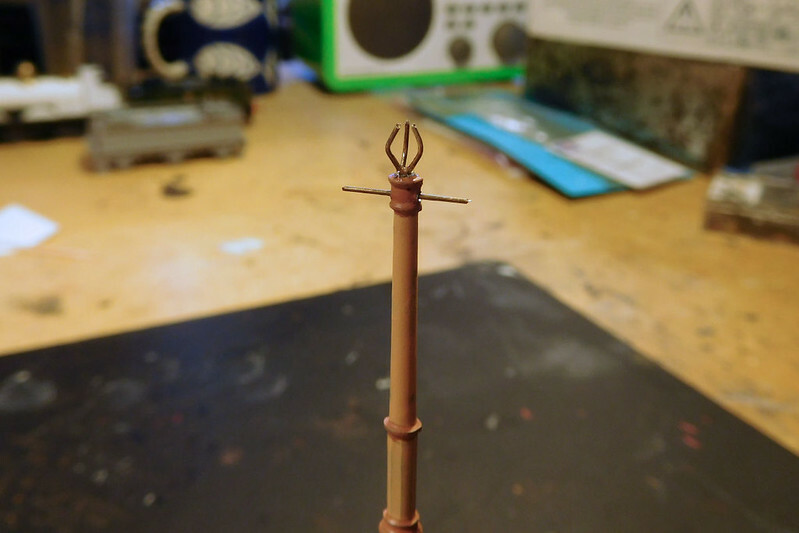 The top/chimney was made from lucky dips in the spares box and plastic rod. Here is a platform type, nearing completion. It's based on a GWR drawing. Photos of these are rare but I found a few. I went for the rather spindly platform construction seen on early versions. A later more robust platform can be seen in Vaughan's GWR Architecture. Below is a standard 13ft type. These had a variety of different lamp houses. This one is based on a picture in Vaughan's GWR Architecture. My photo deceives, it's actually hexagonal like most GWR yard lamps. I now need to add some etched ladders. Some I have tried are too thin and bendy, but these from Wizard are promising. How many more rabbits lamps are you going to pull out of the hat and surprise us all with such cracking work ? You have certainly managed to capture that lamp to my eyes and look forward to seeing more when you are satisfied with it. BTW When you've finished in your "lucky dip" box can I have a rummage please ? A google indicates it is genuine, but probably a bit obscure. However as the Dear Old Thing's use shows, it's readily understood. However we now have "posing like a lamp-lighter."